Carmen is an amazing provider, I have seen many medical professionals and you can tell she really cares. She loves whatshe does and I never felt rushed. She gave enough time for a full physical and addressed all of my concerns. I would highly recommend her! Carmen is an amazing provider, I have seen many medical professionals and you can tell she really cares. She loves what she does and I never felt rushed. She gave enoughtime for a full physical and addressed all of my concerns. I would highly recommend her! Carmen made me feel so reassured about what I’ve been going through and validated my feelings. She really listened to whatI had to say and surpassed all of my expectations. I would definitely recommend her to others and will be seeing her again! Carmen made me feel so reassured about what I’ve been going through and validated my feelings. She really listened to what I had to say and surpassed all of my expectations.I would definitely recommend her to others and will be seeing her again! 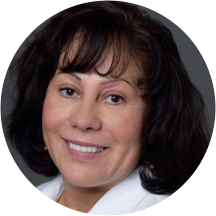 Ms. Carmen Antonellis is a considerate and engaged nurse practitioner serving the community of Malden, MA. Ms. Antonellis attended the Massachusetts College of Pharmacy and Health Sciences, where she received her master’s degree. Ms. Antonellis is a part of Tufts MC Community Care - Malden PCP. She sees patients for illness, as well as other common and specialized reasons. Ms. Antonellis is devoted to ensuring the longevity of her patients’ health and developing long-lasting relationships with them. She takes her time to understand symptoms and give correct diagnoses to ensure the continued health of all her patients. She was so nice! I absolutely love how friendly she was and how comfortable she made me feel. I could tell that she was taking all of my concerns seriously and I feel like I really got somewhere with her. Therest of the staff was friendly as well. Overall I am glad I went here and will go back again! She was cordial, attentive and knowledgable. And she speaks Spanish! Carmen has a warm bedside manner, along with being thorough and detail oriented. She was great! Answered all my questions and I was very comfortable around her. Carmen was so knowledgeable, kind, personable, and thorough. She's amazing and i love her and her medical assistant. They always answer all my questions and i never feel like I'm being judged. Very personable. She took time with me and demonstrated excellent bedside manner. Carmen was very professional, kind, and helpful. And accommodating to my needs. I was late because of traffic, and she as well as the office staff was understanding. I am excited to continue my services with them! Carmen was very warm and friendly. She put me right at ease. She's a great nurse practitioner I would highly recommend going to her !! Carmen was very kind, understanding, and helpful. She was open with me without being abbrasive. I walked out of the appointment feeling informed, confident with my treatment, and willing to return! She was very nice. I enjoyed my time there. I felt comfortable from the moment I walked in and left feeling like I made the perfect choice choosing Carmen at Hallmark Health in Malden. She was attentive, answered my questions, addressed my concerns and ultimately made me feel at ease.The staff was incredibly friendly and Melissa, the MA, was lovely. I recommend Carmen and Hallmark Health to young woman and men in the area! She was so nice and very polite. She answered all of my questions.